David Murray was a Halifax actor, musician and radio broadcaster. For many years he had a regular program on CBC radio called "At the Opera." 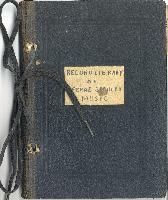 File contains four documents related to David Murray's record collection. All of the record collection items contain Murray's location coding. 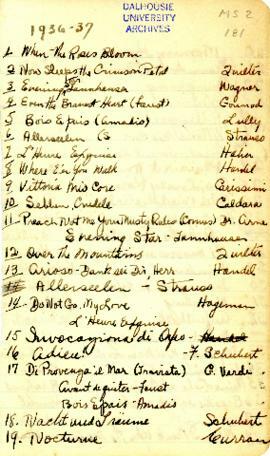 File contains a handwritten 44-leaf notebook containing, alphabetically, Murray's "Record Library of Opera & Secular Music", a short handwritten addendum of record collection additions from 1936-37, a 49-leaf typescript variant collection list and a similar 49-leaf handwritten collection list with different location codes. Description created February 15, 2018.